Garmin GPSMAP 76 features a 4 level greyscale LCD display and adds a European basemap and 8 megabytes (MB) of map storage space to the other outstanding features of the mariner-friendly 76-series navigators. Garmin GPSMAP 76 - rugged handheld navigation for your land and sea adventures. 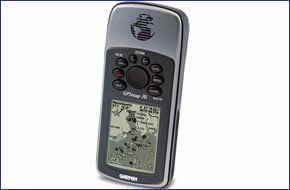 Garmin GPSMAP 76 has been discontinued. Garmin GPSMAP 76 adds a European basemap and 8 megabytes (MB) of map storage space to the other outstanding features of the mariner-friendly 76-series navigators. The Garmin GPSMAP 76 is preloaded with a basemap of principle cities and roads as well as marine navigation aids, including lights, buoys, sound signals and day beacons. It also has 8 MB of internal memory, so you can load detailed maps from a variety of optional MapSource products. If you're into boating or fishing, you can use the Garmin GPSMAP 76's built-in celestial data, which includes sunrise/sunset times and a hunting and fishing calendar. The Garmin GPSMAP 76 is preloaded with a worldwide basemap.